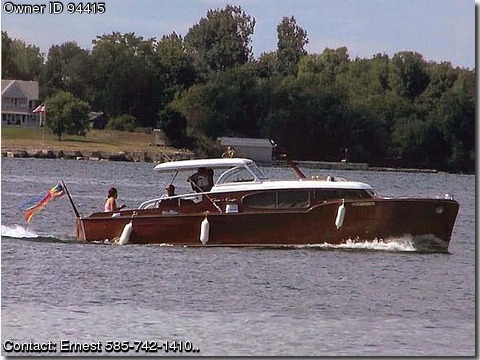 BOAT OWNER'S NOTES for the 34' 1949 CHRIS CRAFT Express Cruiser in VERY GOOD Condition (Some refinishing needed), call Boat Owner Ernest @ 585-742-1410 or email @ aawejp@rochester.rr.com . HISTORY & OVERVIEW: Meet “Miss Adventure”, a 1949 CHRIS CRAFT Express Cruiser, In her earlier years this 34’ CHRIS CRAFT was originally owned by the Edgewood Resort in Alexandria Bay, NY, The resort would give the guests cruises on the St Lawrence river touring the 1000 Islands region, Her name "Miss Adventure" came from Adventure Town where one could experience the thrills of a real live western town and she still maintains that name today, In the early 1980’s present owner Ernest Passaro purchased the vessel from a marina in Cape Vincent , NY, saving her from being demolished because he wanted to preserve her history, He manufactured a custom built trailer especially for the CHRIS CRAFT, this trailer is good for hauling 20,000 pounds and is made from 10 inch lite I-beams which can transport any boat up to 36' in length, This 34' CHRIS CRAFT Express Cruiser (Miss Adventure) is a big part of the 1000 Islands history, Fully restored inside and out and with many updates, Stored inside during the winter months, Very economical to run and user friendly, Our family of seven has enjoyed this boat for many years. ELECTRONICS: Eagle navigation system , Lowrance Depth Finder and Fish Finder with GPS navigation , Ship to Shore Radio Communication. BATTERIES & SHORE POWER: Four Battery bank system with battery switches , Onboard battery charging system , Updated shore power. MISCELLANEOUS FEATURES: Electric water heater, TV, Updated Head with holding tank and hand held shower, Stainless Steel Bait well , two new fuel tanks with sending units , Swim platform. SAFETY: Halon Fire Extinguisher System . For further information or if you have any questions please feel free to call me @ 585-742-1410 or email me: aawejp@rochester.rr.com .